Written by Colin Nederkoorn on January 20, 2015 . 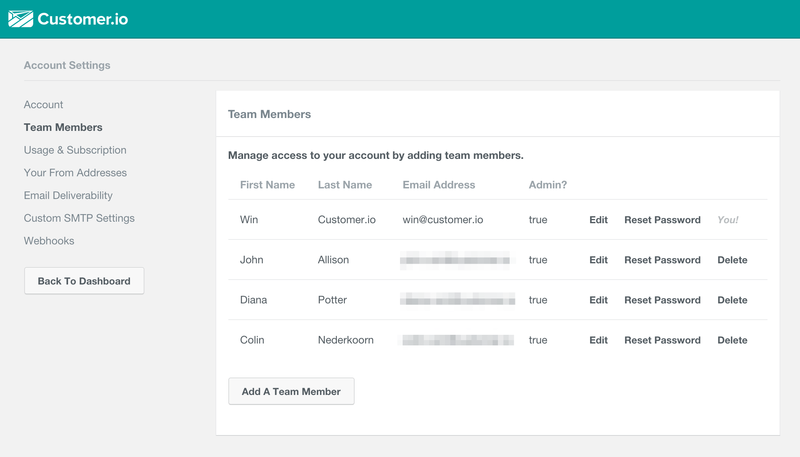 You’re now able to invite other people (consultants, your boss, friends, coworkers, office pets) to log in to your Customer.io account. This feature is available on the Small Business plan and higher. Team Members have full access to your Customer.io campaigns. The only thing they cannot do is make changes to other Team Members. Reach out and let us know about other things you’d like to be able to do with Team Members in Customer.io.